Joey Calistri fights past a defender to maintain possession of the ball. The senior forward picked up an assist in NU’s comeback win on the road against Penn State. One weekend after scoring with 1:02 left to beat Michigan State on Senior Day, the Wildcats (7-7-2, 4-3-0 Big Ten) scored twice in the final 12 minutes to spoil the same occasion for Penn State (6-7-3, 2-4-2) on Sunday afternoon, escaping with a 2-1 victory. The Cats were again heavily out-shot in the game, taking 14 fewer shots than their opponent and putting five fewer on goal, and fell behind early on a gusty day at Jeffrey Field in State College, Pennsylvania. The Nittany Lions took the advantage in the 11th minute thanks to a spectacular hit by midfielder Connor Maloney. Penn State forward Riley Grant stole the ball from the Cats’ junior midfielder Jeffrey Hopson, who had it caught up awkwardly between his feet, and touched it to Maloney, who unleashed a shot from 25 yards out that curled perfectly into the top left corner of the goal. With the wind at their backs in the second half, however, the Cats made a late push to level the match and stunned the home crowd of 2,022. 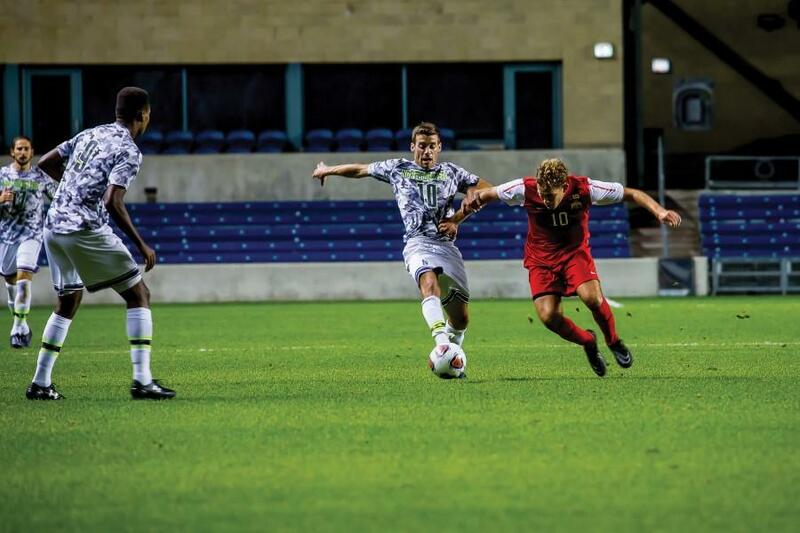 In the 79th minute, senior forward Joey Calistri dribbled toward the box and passed the ball through a Penn State defender’s legs to hit junior forward Mike Roberge in stride. Roberge hammered a rocketing shot by Penn State goalkeeper Evan Finney and off the underside of the crossbar to tie the match. Two minutes and 33 seconds later, NU then struck for the winner. Freshman midfielder Camden Buescher beautifully curled a corner kick from the left side onto senior defender Henry Herrill’s head. Finney got a touch on the ball, but it skittered toward the goal line until Penn State forward Noah Pilato’s attempted clearance ricocheted off of NU junior defender Nathan Dearth and into the net. Penn State held the lead for more than 67 minutes and controlled the flow of play for most of that time, too. NU senior goalkeeper Zak Allen continued his excellent form of late by making six saves, and the defense in front of him blocked a large number of promising scoring opportunities. Lenahan noted that he was “really disappointed” with the team’s ability to produce scoring opportunities in the first 30 minutes of the second half. He made a formation change, adding an extra forward and removing a defender, which sparked the late surge. With one regular-season match remaining — at last-place Wisconsin on Wednesday night — the Cats are now tied with Rutgers for second in the Big Ten standings at 12 points and trail first-place Ohio State by one point. The Scarlet Knights travel to Maryland (nine points) on Wednesday while the Buckeyes host Michigan (11 points). The reality that NU remains in very serious contention for the regular-season conference championship despite being outshot 127-60 in its seven Big Ten games combined is something the team has said is almost hard to believe. Dearth, however, said the team has learned much about its own composure from the unexpected success.